As of today, school is back in session! So, it only seems fitting that I'd share a little update in our new 1st graders bedroom. This change didn't really come about because of school, per say, but it does involve a desk...so there you go. This is how we started in Tessa's room. Keen observers may have noticed that the white dresser that served as her beside table recently moved to the porch. Who doesn't love good ol' multi purpose furniture - you know this girl does! The dresser is now working perfectly on the porch holding napkins, candles, placemats and such, which makes room for a new addition in Tessa's room. Of course, I mean 'new' in the sense that it's new to her room, but not new to this house or me, for that matter. As you know, I'm totally in support of using good quality, solid wood (antique, if possible) furniture in my home - and I love how the dark wood plays off the white bed frames (you know how I feel about matching sets) - but even I can admit that this feels a little "mature" for a kid's room. Never fear, it's nothing some good quality accessorizing can't handle. Starting with this too cute teal ottoman I found on clearance (it's ok to hate me a little) at Target for less than $25. Such a good deal I got it in pink and teal. 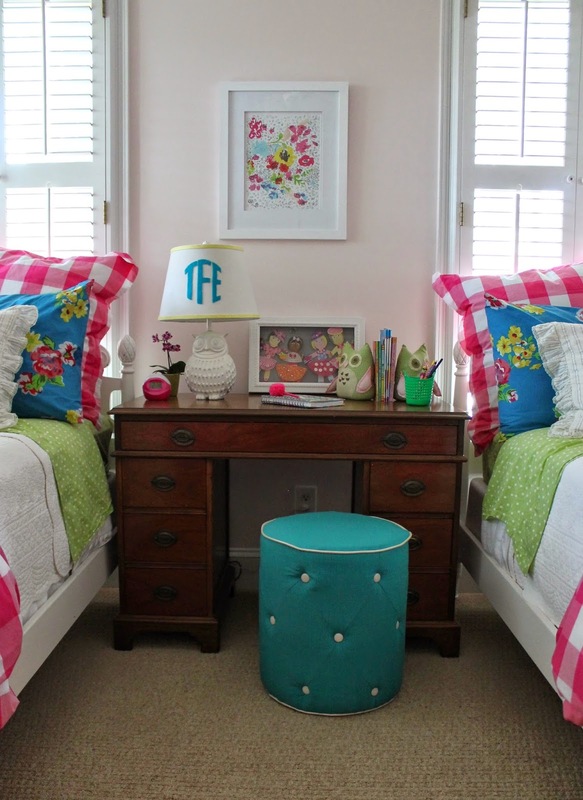 Like a mom of two girls can't find a place for a hot pink ottoman, please. I love the teal against the dark wood, how it helps to break up all the pink in the room, and brings out the blue in the pillows. Plus, the youthfulness of the ottoman really freshens up the whole look of the dark, heavy 'mature' desk. Once the little seat was in place, it felt kind of natural to kit out her desk with her favorite (of the moment) books, workbooks and journal all corralled by another youthful punch in the form of the owl bookends. 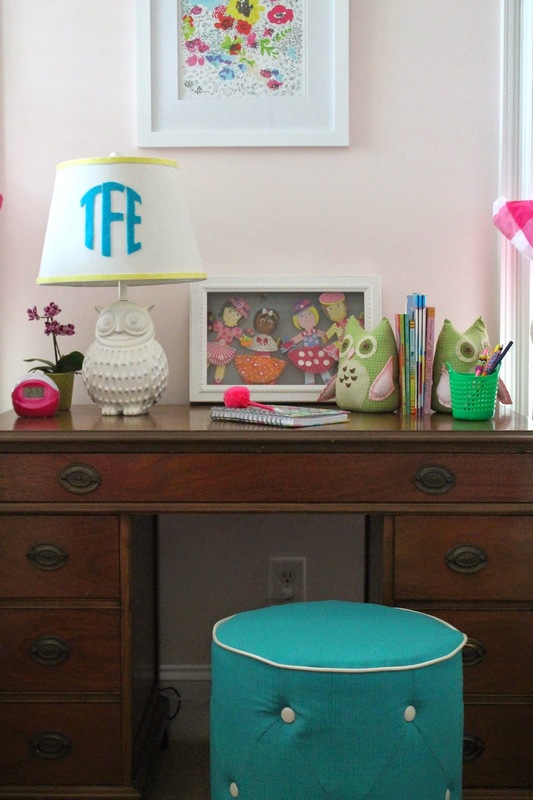 Who remembers the owl lamp and monogrammed lampshade? One of my first projects some 3+ years ago. Now, do I really think she's going to sit in her room and do her homework? No, I am not delusional. But, she does like to spend some time alone, away from her little sister, from time to time and I hope she'll enjoy this new little spot of her very own. 2. mixing wood finishes adds warmth to your space and helps to keep it interesting. NO matching sets. 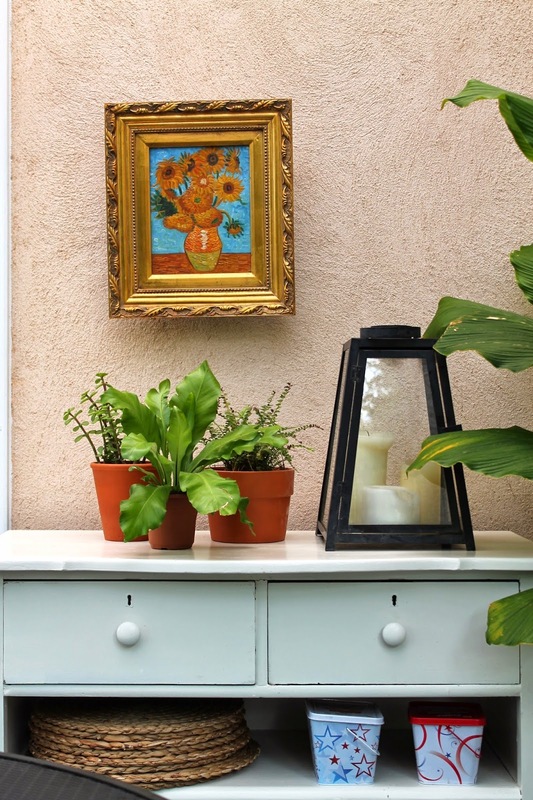 3. adding the right accessories can freshen even the most 'mature' of furniture.